The Creativity Emporium. Creative Development. Inner magic released. From controversial issues to emotion poems. Develop your potential. but often they can't find the time even to try to get there. Creative development? They can't even find fifteen minutes for a little exercise. Work expands to fit the time available. These past decades, for millions of people, work has been expanding to fill every corner of life - just like ivy that may be beautiful, but if you let it grow unchecked, it chokes everything else, blocks every window. Most people finally have enough - they cut it back so that they can let in more light. How do we cut back on work? It's never easy - just as it's not easy to lose weight. But millions of people - with enough determination and, often, a good diet program - manage to do it. Most people find it easier when they're not doing it alone. The Creativity Emporium - part of the plan to let more light into our lives so we can grow further emotionally and intellectually, reach more of our potential. And the updates - one way of not being alone, of encouraging our creative development. It stimulates thinking. Loads of good thinking all around at the creativity emporium – as tempting as ice cream at an ice cream parlor. So many flavors. And here, so many good ideas. Big ideas - like about the ultimate reality, animal rights, the roots of ethics. Life expands when we take the time for big ideas. 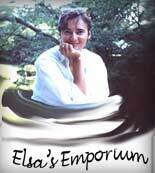 What else does The Creativity Emporium do? It opens up feelings. It brings you more to life. When we rush, we often miss out on just plain feeling, on enjoying taking a walk at 8 in the evening, on falling in love, on anything. So many riches within. Often they wait around, unnoticed in the rush of everyday life. If anything, the riches may be felt as a burden - it would be easier if we felt less. Or our inner riches may not be felt at all, sometimes for years. We're just plain too busy, rushing forward and forward and even further forward. It's like ignoring the most amazing sunset in the world because we're watching commercials on a flat screen tv. And then, the updates. The web is huge and ever shifting. Millions of sites - like there are millions of stars in the sky. But stars are easier to find again than sites. There is no fixed map for sites. We can search and search. Often, we can't find our way back. Plus, our own lives are often as packed as the internet universe. It's so easy to lose things we want to keep. Without the updates and what they offer - inner fires stirred, inner riches released - the Emporium is gone for you. The Creativity Emporium. Creative Development. Inner magic released. From controversial issues to emotion poems. Develop your potential, your inner riches.